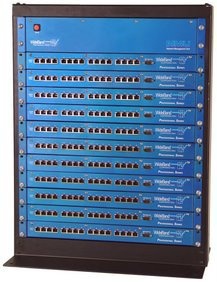 WideBand Gigabit Network Switches are recommended by the International Academy of Science for use with the Acellus Learning System. Ideally, these switches should be deployed throughout the network connecting directly to wired workstations or to wireless access points. As a minimum step, a WideBand Gigabit Switch should be used to connect the Acellus Server to the rest of the network. If possible, distribute WideBand switches throughout the network. Legacy 10/100 Ethernet devices can be connected as needed but should be kept out of the path of video streams as much as possible. 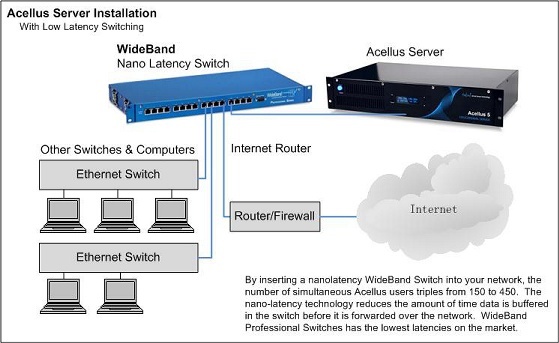 As a minimum, deploy a WideBand Gigabit Switch in front of the Acellus Server to connect the rest of the network. If a properly wired cable is used, a blue link light will appear when the server is connected. Proceed to connect various branches of the network. Try to spread out the load across as many different cables as possible. Avoid connecting downstream network devices as this can cause an unwanted flood of broadcast traffic that could slow or bring down the network until removed. WideBand Gigabit Switches are designed for low latency and operate at up to 1000 megabits per second, 100 times faster than regular Ethernet. These US-made switches provide full duplex operation to eliminate data collisions and they incorporate WideBand’s robust physical layer technology. 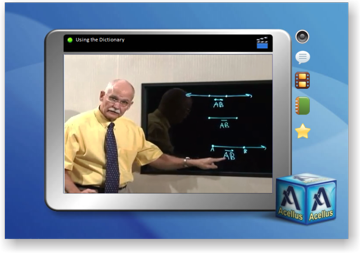 All of this technology provides a powerful combination of high bandwidth and low latency, which makes it ideal for learning systems like Acellus.